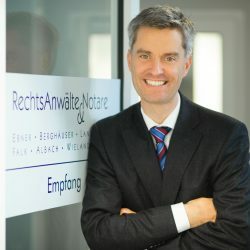 Member of the working groups for tax law (www.steuerrecht.org), tenancy law and real estate (www.mietrecht.net) of the German Lawyers Association. Member of the 2nd, 3rd and 4th statutory meetings of the Federal Chamber of Lawyers (www.brak.de). Doctorate: 1995 with a dissertation on the topic “Accounting records as subjects of confiscation at tax consultant offices”. Since joining the office in 1995, my activities have focused on civil law, in particular tenancy and real estate law. I also advise and represent landlords and tenants before courts in matters relating to commercial real estate or apartments. It is particularly important to me that goals are achieved as quickly and economically as possible. This is often much more helpful than a long lasting lawsuit. In the interest of my clients, I also use my extensive experience to implement rules in rental or lease agreements during contract negotiations that avoid conflicts later on. I advise many of my clients already during contract negotiations in which I participate or where I assist in the background. My clients include major lessors of commercial real estate, doctors, pharmacists, architects, medium-sized companies, restaurateurs and private landlords. Furthermore, I am also active in other fields of civil law, mainly dealing with issues relating to acquisitions (real estate, houses, apartments, automobiles and other motor vehicles) and contracts for work and services, fee claims by physicians, accounting and dispute issues arising at energy supply companies, and advise in situations related to insolvency. In inheritance law, I represent my clients in inheritance certificate proceedings, in case of inheritance disputes, in matters relating to legacies and compulsory portions. I advise proactively by drafting suitable rental or lease agreements and partition declarations of condominium communities, but also in the event of ambiguities arising in the course of a tenancy: Defects, maintenance, aesthetic repairs, energy conservation measures, modernisation, operating obligations in shopping centres, manner of use, subtenants, rent increase, index clauses, terminations, deposits, sureties, compensations, lessor’s lien, written form of tenancy agreements. I take part in negotiations in order to resolve disputes definitely and quickly. Sometimes a lawsuit cannot be avoided: In this case, I vigorously represent my client’s rights before local, state and higher regional courts throughout Germany, without neglecting the objective and the economic background. This annoys some opponents because I am very committed to the individual case. Some proceedings have already produced favourable solutions, which may also include settlements. I advise and represent clients in appeal and complaint procedures before tax offices and tax courts. I advise clients on the filing of voluntary disclosures. I support my clients in tax optimisation in order to avoid unnecessary inheritance tax or gift tax payments. Together with renowned professional liability insurers, I defend tax consultants and auditors against liability claims. I advise and represent clients in proposed advertising campaigns. I advise clients on warnings due to unauthorized advertising and represent them in court. I support my clients in the registration of trademarks and other characteristics which stand for their company, in case of objections against registered trademarks and in case of lawsuits arising from trademarks and other characteristics. In case of complex mandates, I regularly cooperate with experienced tax advisors as well as experts and, if necessary, also arrange appropriate contacts. LG Darmstadt, Urteil vom 08.01.2008 – 16 O 164/07, GRUR-RR 2008, 375 (Der vom späteren Kläger abgemahnte Beklagte muss dem Kläger mitteilen, dass er wegen desselben Gegenstandes inzwischen eine strafbewehrte Unterlassungserklärung abgegeben hat: Die Kosten des Verfahrens hat dann der Beklagte zu tragen).